Students considering applying to online colleges in Nevada can use this guide to learn the ins and outs of factors including tuition expenses, enrollment, and scholarship opportunities. The state of Nevada has one public two-year university and 26 public four-year institutions. It also offers three private nonprofit institutions and 15 for-profit institutions. Each university charges its own tuition rates, and several offer scholarships. This guide outlines scholarships for students who live in Nevada, and gives an overview of the state's average tuition rates both for residents and nonresident students. There are several fast-growing jobs in Nevada with very large growth percentages that are outlined in this guide to give students an idea of employment rates and job opportunities they can expect after graduation. But before we dive into our list of the best online colleges in Nevada for 2019, let's start with the state of higher education and online education in particular in Nevada today. During the 2015-2016 school year, Nevada was home to 26 four-year public institutions, three nonprofit four-year institutions, and 15 for-profit institutions. In 2016, Nevada saw the highest enrollment in the nation, with 136,102 enrolled students. Most of the state’s colleges and universities feature different tuition rates for in-state and out-of-state students, but some offer a universal price to all students. On average, tuition for in-state students at public four-year institutions costs $7,660. Nevada’s flagship university, the University of Nevada at Reno, charges in-state students $7,764 for tuition, and $22,236 for out-of-state students. Some colleges participate in initiatives to reduce the cost of out-of-state tuition. Otherwise, nonresident students may seek out a variety of financial aid opportunities and resources. According to the National Association of State Students Grant and Aid Programs annual survey, Nevada students received $12,629,478 in need-based financial aid for the 2015-2016 school year, and $30,352,142 in non-need-based aid. The best online colleges in Nevada provide students with ample financial aid resources, including aid advisers, to help them explore their options. Often, financial aid can help cover the difference between in-state and out-of-state tuition costs, helping to make it possible for out-of-state students to attend online schools in Nevada. In 2015, 38,971 undergraduate students and 2,077 graduate students in Nevada took at least one online course. That same year, 12,306 undergraduate and 1,054 graduate students took exclusively online courses. Of students enrolled in online courses in Nevada in 2015, 94% had Nevada residency, with the rest living outside of the state. The College of Southern Nevada features the highest concentration of students enrolled in online programs (14,906 students). The University of Nevada at Las Vegas boasts the fastest enrollment growth for online programs, having experienced an increase of 1,967 students enrolling in online programs between 2012 and 2015. Some schools offer a flat tuition rate for both in-state and out-of-state students, but most offer lower expenses for their resident students, and significantly higher costs for those with out-of-state residency. Nonresident students enrolled in online colleges in Nevada may qualify for special tuition breaks through the Western Interstate Commission for Higher Education (WICHE). WICHE enables resource-sharing among western higher education institutions, and has served western schools since 1953. The organization distributes around $9,000 each year in tuition discounts to students, and serves 16 western states, including Alaska, Arizona, Colorado, New Mexico, and Oregon. WICHE’s Western Undergraduate Exchange ensures that out-of-state students do not pay more than 150% of in-state tuition at participating schools. Eligible students must have residency in a WICHE member state. Below, you will find our rankings of the best online four-year programs in Nevada. Our profiles look at how schools approach online education and then list out their services for distance students and their popular, fully online degrees. After reviewing the best online schools in Nevada, explore our state resources, like a database of every college and university in Nevada or our index of popular in-state scholarships. Headquartered in Elko, Great Basin College boasts more than a dozen satellite campuses and facilities across the state. GBC was founded in 1967 as Elko Community College. Since then, the college has attained regional accreditation from the Northwest Commission on Colleges and Universities and become one of the top providers of Nevada state college online courses. GBC offers seven fully-online bachelor's degrees in the arts, sciences, and applied sciences. Available programs include English, social science, land surveying, digital information technology, graphic communication, management, and an RN-to-BSN track. The school also awards seven associate degrees, including infant and early childhood education, general business, and accounting. Annual online enrollment numbers at GBC frequently reach more than 3,500, with an online student body comprised of individuals who live around the state and across the country. Online programs require no on-campus commitments, although the nursing program does require on-site practicum experiences; students arrange these in collaboration with local healthcare facilities and GBC faculty. Although specific application requirements vary depending on a student's degree track, many programs offer rolling admissions, allowing students to apply at their convenience. GBC practices noncompetitive and open admissions for many programs; does not list specific GPA or test score requirements; and emphasizes the availability of refresher courses, which students can take to prepare for collegiate-level admission if necessary. GBC welcomes transfer students and students seeking a second bachelor's degree; however, it only evaluates transcripts if transfer students have already submitted their applications and declared a major. Nonresident students exclusively taking distance learning courses pay a small additional fee per credit. Originally founded in Elko as the State University of Nevada, the University of Nevada, Reno eventually moved 300 miles southwest to its present location. Today, UNR employs more than 900 faculty members, teaches about 18,000 full-time students each academic year, and holds regional accreditation from the Northwest Commission on Colleges and Universities. Until 1965, UNR operated as the only four-year institution in the state. An estimated 22,000 students take at least one online course at UNR each year, and the school offers more than 200 online classes. Individuals interested in earning a master's degree online can take advantage of UNR's programs in education (literacy, information technology, and educational psychology), business administration, justice management, social work, public health, and behavior analytic psychology. The school also offers an online doctorate of nursing practice. Many online programs at UNR feature multiple start dates throughout the year, providing students with increased flexibility. While UNR is currently seeking approval to offer its online courses in all states, the institution encourages nonresidents to consult with the online learning office before applying and independently evaluate the applicability of courses to any licensure or certification they wish to pursue in their home states. Specific admissions requirements vary depending on the degree track, but graduate programs generally require a 2.75 minimum undergraduate GPA, official transcripts from prior institutions, GRE or GMAT scores, a resume or CV, a statement of purpose, and three letters of recommendation. The graduate application requires payment of a nonrefundable $60 fee. Like many other online colleges in Nevada, UNR charges higher tuition rates to out-of-state students. However, residents of nearby states pursuing undergraduate-level coursework may be eligible for reduced rates through the Western Undergraduate Exchange. Based fewer than two miles from the Las Vegas Strip, the 332-acre University of Nevada, Las Vegas campus houses the only dental school and law school in the state. This public research university began as a division of the University of Nevada, Reno before securing its individual status and current name in the late 1960s. Nearly 25,000 undergraduate students, 5,000 graduate and professional students, and 1,000 faculty members make up the academic community at UNLV. Students interested in attending a top Nevada state college online can take more than 200 online and hybrid courses at UNLV. The same faculty who deliver classes on campus also organize and teach online courses. More than 20,000 students take at least one online course at UNLV each year. UNLV hosts various online certificate programs, as well as master's and bachelor's degrees in nine disciplines, including emergency management, nursing, education, liberal arts, public policy and leadership, healthcare administration, and hospitality management. Students should note that program availability may vary by state. All online classes at UNLV follow an asynchronous format; students need not log on at prescribed times, but can progress towards deadlines according to their own schedules. Although nonresident students at UNLV typically pay an increased tuition rate, out-of-state students taking online courses may qualify for a discount. Degree-seeking online students must apply for general university admission, and different requirements apply to first-time freshman, transfer students, and graduate students (e.g., different minimum GPA and test score requirements). Additional documentation, such as letters of recommendation, may also be required depending on the program. Sierra Nevada College offers a private, nonprofit, liberal arts education to about 600 undergraduates and 500 postgraduates. The campus location in Incline Village -- nestled in the Sierra Mountains -- allows for unique college programs in ski business and resort management, in addition to traditional programs in the humanities, environmental science, education, and fine arts. Furthermore, an 11-to-1 student-to-faculty ratio ensures a personalized learning experience. Since its founding in 1969, SNC has developed into one of the top-accredited online colleges in Nevada, offering distance learners two bachelor's degrees (in psychology and global business management) and two graduate degrees in education (featuring specializations in administration or English language acquisition and development). Faculty deliver online courses in six-week modules, and students only need to take one or two classes at a time to maintain full-time status. Online undergraduate programs at SNC accept first-time freshman and transfer students. Prospective online students interested in transferring can send in their transcripts for a credit evaluation without needing to submit an official application. Online students at SNC pay a reduced flat-rate tuition cost per credit, in addition to a flat fee each semester. Students can submit applications on a rolling basis throughout the year, and applicants usually receive an acceptance decision within two weeks. Standard criteria for freshman admission include a minimum 2.6 GPA and SAT scores above 400 or ACT scores above 19. Graduate school applicants must possess a minimum undergraduate GPA of 2.75-3.0, depending on the program, and passing scores on the Praxis Core or CBEST. To maximize flexibility for working students, SNC's graduate programs offer start dates in January, March, May, August, and October. SNC does not charge aspiring undergraduates an application fee, although a $50 application fee applies to graduate students. The College of Southern Nevada -- the largest public college in the state -- began as Clark County Community College in 1971. Today, the school employs more than 2,500 faculty and staff, boasts a student population of 34,000, and consists of three separate campuses in the Las Vegas Valley. Several additional learning centers, including one at Niels Air Force Base for active military personnel, expand the school's reach even further. Among Nevada online colleges and universities, CSN stands as one of the most flexible. The majority of students attend class part time, and all online courses follow an asynchronous structure without any set meeting times. Online offerings at CSN include four certificates and 21 associate degrees. Students can choose to pursue a variety of academic subjects, including business management, computing and IT, early childhood education, psychology, and world languages. Online students also receive ample support, such as free online tutoring and access to an online library and writing center. CSN adheres to an open-door policy of admitting anyone seeking a post-secondary education, whether they plan to pursue a full degree or only take a few online courses. However, applicants must possess a high school diploma or GED certificate in order to declare a major. Students must also submit high school transcripts and transcripts from any previously attended colleges or universities. Nevada residents pay lower tuition rates than nonresidents, although qualifying nonresidents of certain states can receive tuition discounts through the Western Undergraduate Exchange program or through CSN's Good Neighbor program. Below, you’ll find all of the online schools in Nevada sorted by their tuition rates. 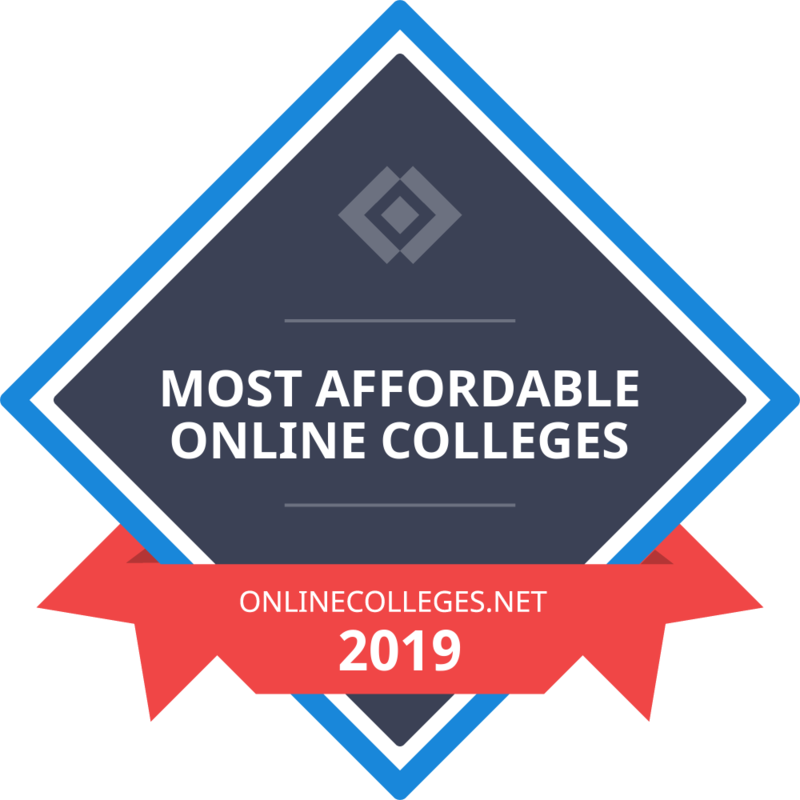 Our list of the most affordable online colleges in Nevada based on in-state yearly tuition, or annual tuition rates if a school does not differentiate between in-state and out-of-state students. Tuition rates are based on a full course load each semester or term. All colleges on the list offer at least one bachelor's degree completion program available entirely online. The online schools in NV with the lowest tuition are ranked highest, providing prospective students with a true list of the most affordable online colleges in their state. Online colleges in Nevada prepare students for many fast-growing job opportunities in the state, such as electrical assemblers, machinists, and production operators. The manufacturing field offers some of the state’s fastest-growing job opportunities. As of September 2018, the Nevada’s unemployment rate was 4.5%, and decreasing consistently month over month. The annual mean wage for all Nevada occupations is $45,040, though several fields offer significantly higher annual salaries. For example, marketing managers in Nevada earn an average salary of $138,660 per year, and computer and information systems managers enjoy a $133,460 salary. Nevada is experiencing rapid employment growth among positions for assemblers, industrial engineers, and electrical engineers, whose fields are growing at rates as high as 401.2%. The Nevada Promise scholarship is open to students with high school diplomas from Nevada high schools who have not yet earned an undergraduate degree. These scholarships serve outstanding seniors from Elko, Humboldt, Pershing, Eureka, and Lander counties. Applicants must graduate from a Nevada high school and hold a 3.0 cumulative GPA. Students receiving Nevada's Otto Huth scholarship must apply before their 20th birthday, have their high school diploma or GED, and register full time at an accredited college or university in Nevada. The Ron and Linda Smith Family scholarships require applicants to reside in northern Nevada, have a high school diploma or GED, enroll at least half time in a degree or certificate program, and hold a minimum GPA of 2.0. Applicants must have graduated from high school in the Clark County school district with a 3.0 minimum GPA. To earn the UNR Presidential scholarship, full-time incoming freshmen must have at least 15 university credits and a 3.5 GPA, and score at least a 31 on the ACT or 1420 on the SAT. Featuring three different award levels, this scholarship awards $11,000 to students with a GPA of 3.75 or higher, $9,000 to those with a 3.5-3.475 GPA, and $5,000 to those with a 3.0-3.49 GPA. Students attending an accredited college in Nevada or Utah full time may qualify for these scholarships if they finish at least half of their program with a minimum 3.0 GPA and express interest in a hospitality-focused career. To qualify for the Kenny C. Guinn Memorial Scholarship, students must be entering their senior year with 90 or more credits, major in elementary or secondary education, and hold at least a 3.5 GPA. Awarded to students planning to earn their bachelor's degree from a nonprofit institution, the Horatio Alger Nevada scholarships cater students whose annual family incomes amount to $55,000 or less.